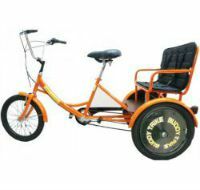 A buddy trike is an awesome way to share a fun ride with your kids or grand children. Sometimes spending quality time with the kids and finding time to exercise can be a problem. This may be a good solution. The rugged steel frame is built to handle 135 lb passenger weight and a total weight of 450 lbs. The generous gusset on the steel frame allows for step through design so mounting and dismounting is a breeze. The 20 inch cruiser tires and padded seats give a smooth cushioned ride.The 6 speed shifter helps the rider to tackle hillier terrain. Parents of special needs children especially like that the child can have some fun that they may otherwise not be able to enjoy. 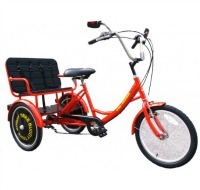 The buddy trike is now available with electric pedal assist for even more riding pleasure. When the kids get a little bigger and heavier you can keep right on riding with ease.